At the end of a hectic day there is nothing like lying down on a fresh and soft bedding, but how many of you are equally concerned about the interior of a bedroom? Creating chic yet functional and calming bedroom interior is a daunting task, but with a high impact feature wall you can make your room stand out. Whether you like to make a statement, or just want to impress the visitors without overwhelming them, feature wall is a terrific way to improve the visuals of your room. It’s an unusual wall that pops out and draws attention to the decorative pillows and bedspread with its unique design, color, sheen, shine or striking textures. A feature wall is a more like a canvas that gives you the chance to tryout a design or a color on a small scale you would never apply on a larger one. That’s why a feature wall can be a blast of color or design as it gives your room a truly distinct style. To sate your thirst, AmerAdnan Associates has shared its most stylish bedroom feature wall design ideas that will sweep you off your feet. The modern design of the accent wall is creating a stunning focal point with its textured paint and overlapping wooden strips. 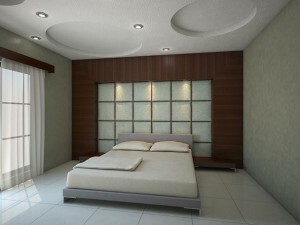 Something professional interior designers in Pakistan really adore. 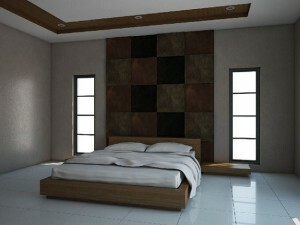 A trendy master bedroom with a fabric upholstery to give a softer appearance. Whereas the wooden frame panels are perfectly complementing the plain white tile floor. 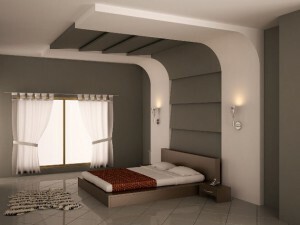 The concrete mass and louver – continues from ceiling to wall – is a wonderful design inspiration for modern bedroom remodel. 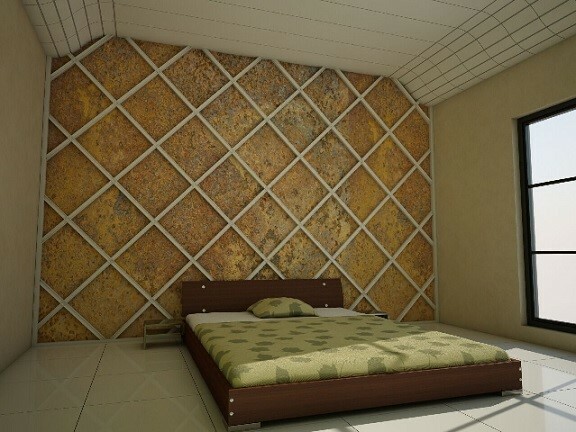 The fantastic feature wall of the bedroom boasts textured tiles in multiple hues to give the space a modern feel. How have you embellished your wall? We would love to hear from you. So don’t forget to share your views in the comments section below.